Published in Comparative & Historical Sociology, ASA newsletter, 16(2), Spring 2005. Also available, with response, in pdf format. Please cite as: Deflem, Mathieu. 2005. "Sociologists, One More Effort! A Propos Goodwin." 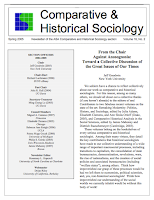 Comparative & Historical Sociology, ASA Section newsletter, 16(2):4-6. It has become increasingly difficult, because of time and other constraints, to respond to the copious amounts of writings praising or representing so-called public sociology. It has also become increasingly difficult not to write a satire about these developments. But I will make another effort in light of the recent From the Chair message by our current section Chair Jeff Goodwin (2004). Goodwin encourages comparative and historical sociologists to contribute to public sociology, and furthermore informs us that many of them have already done so. It will not be necessary here to repeat in detail my criticisms of the project of public sociology, which I have clarified —and will continue to clarify while time and energy permit— in various publications (Deflem 2005a,b, 2004a,b,d) and online activities.1 Suffice it to reiterate that I not only object to the mission of public sociology as it is commonly understood these days, and not only do I question the basis of public sociology and its stated objectives.2 I reject the very demarcation of public sociology from other made-up types of sociology as well as the pluralization of assorted public sociologies. Amongst other reasons, these labels are to be rejected because they presume that there can be or is a sociology that is not public, and are introduced for strategic reasons to seek to legitimize activities that are ideological in nature and never can be, and should not be accepted to be, on equal footing to contributions in sociological scholarship. To be sure, sociologists ought to conduct their work always as public intellectuals, and we can and, I believe, should inform societal interventions —as I do so myself, at least to the best of my abilities. But public sociologists do not advocate sociological activism, but instead promote an activist sociology, which is informed by a particularistic political agenda, denying the pluralist nature of morality in contrast to the universal appeal of science. Witnessing the thoughtlessness of public sociology’s popularity, there is not only widespread misunderstanding about its epistemological void, questions about its effectiveness are conveniently overlooked as well. Sadly, in view of these developments, I doubt it that sociology has ever been less relevant to society than it is today. In the interest of plain speaking and clear understanding, my criticisms are threefold: 1) Goodwin misunderstands the nature and rise of public sociology; 2) he distorts comparative and historical sociology; and 3) he has conflated his scholarly and professional roles. Firstly, contrary to Goodwin, the theme of public sociology at the ASA meetings in San Francisco did not provoke a “great deal of discussion, debate, and introspection.” In fact, I cannot, in my admittedly but a decade-long experience of attending ASA gatherings, think of a meeting that provoked less thought of any sociological kind. The 2004 ASA President Michael Burawoy (2004b, p.10) had by his own admission organized the meetings in a narrow frame on the basis of a “mandate” he proclaimed to have received from the ASA membership by virtue of his election —something along the lines of President Busch after his re-election reaching out to those ‘who share our goals.’ Instead of inviting sociologists to speak about and from their sociology at the San Francisco meetings, activists were invited to speak from a political platform that had passed the scrutiny of public sociology. Public sociology speaks with one voice which only its adherents can hear. Goodwin contributes the rise of public sociology to the leftist political orientation of many sociologists. But I am left wondering on what grounds Goodwin concluded that “most sociologists by far are liberal (in that distinctly American sense).” Not being an American citizen, but an American sociologist nonetheless, I may be challenged to address this matter. Yet, did Goodwin measure our political attitudes? Is he interested in doing so, and does he have a thought police at his disposal to help him? Will he stamp an ‘L’ on those found to be liberal, a ‘C’ perhaps on those who are not? Sadly, this is not mere satire. On the occasion of two recent resolutions, the ASA included opinion questions without any basis in policy. The argument that sociologists’ political orientation is related to the rise of public sociology is not new. Burawoy (2004a) made the same comment with respect to the ASA Iraq War resolution. Like Goodwin, he offered no proof. Yet, it is striking that in suggesting the hypothesis, Burawoy and Goodwin have admitted that they do not conceive of public sociology as an open debate but as a singular position. It is not my concern that this position is leftist. What is remarkable is that political dissent and normative pluralism are not an option. Alternatively, a sociological hypothesis might suggest that the widespread embrace of public sociology relates to the excessive proliferation of graduate programs in sociology, the resulting deterioration of the state of sociological research and teaching, the culturally induced transformation of the profession of sociology from a skill to a right, and the continued separation between center and periphery in the professional sociological enterprise. Public discourse in the U.S. is not all that is “fairly wreteched”, as Goodwin claims, so is that which passes for public intellectual culture among sociologists these days (and which ought to be our primary concern). My hypotheses also have to be tested, but at least they are sociological. Second, Goodwin informs us that many comparative and historical sociologists already engage in public sociology by investigating the origins of the present, drawing lessons from history, and showing that things could be different. I agree that many of us engage in at least two of these things. What else but the origins of the present could we be studying when we engage in historical work without being historians? What else but lessons could be drawn from history when we study the past in the present? And the same could be said for comparativists in terms of the variable contrasts, similarities, and linkages that exist across dispersed societies. But why would this be public sociology? Goodwin’s framing of others’ works for his purposes is not particularly original, as they mirror Burawoy’s (2004a; Burawoy and VanAntwerpen 2001) similar boxing-in exercises. It is audacious for public sociologists to lay claim to sociological accomplishments that have developed very well without them and that will continue to do well within the established and evolving paradigms of sociological scholarship. Perhaps I ought to be grateful at least that Goodwin does not know my work and did not box it into his framework. But do those colleagues whose names were included feel comfortable to be told that theirs are works in public sociology? And what about the comparative scholars whom Goodwin all subsumes under the utopian heading? Are they now all, like Goodwin, sudden converts to public sociology? What purpose can such conversion serve? Maybe we can learn from history indeed. We can learn from the fact that the ASA Iraq War resolution did not save a single life in the senseless destruction that is taking place in Iraq, while it did serve to resolve for organized sociology important questions of analysis and functioned self-servingly as feel-good exercise and impression management. In that light, it is not surprising that the rise of public sociology has gone hand in hand with the commercialization of sociology in the ASA (Deflem 2004c). Third, in the spirit of promoting public sociology, Goodwin ends his statement with a call for submissions to the magazine, Contexts, which he and his friend Jim Jasper now edit. I regret that Goodwin and his friend have decided to exclude from Contexts those of us who do not adhere to public sociology. In the context of his message as Chair of our section, I also question the conflation of professional roles. Perhaps nothing else could be expected from the advocate of a position that differentiates itself from what is called ‘professional sociology,’ when comparative and historical sociologists have been at the forefront of the study of professionalization, and they above all should know the difference between sociology as discipline and as profession. Maintaining such a distinction and recognizing its value, I will continue this response beyond the context of this newsletter. Consult the pdf version for a response. 1. See my campaign website, savesociology.org. Copies of my publications are also available online via www.mathieudeflem.net. 2. My comments concern the version of public sociology popularized by Michael Burawoy (2004). The term was originally coined by Herbert Gans in a different meaning that does not fit Burawoy’s cells of public, policy, critical, and professional sociology (Gans 2002, 2004; Hausknecht 2002; Burawoy 2003). Burawoy, Michael. 2004a. “Public Sociologies: Contradictions, Dilemmas, and Possibilities.” Social Forces 82(4):1603-1618. ____. 2004b. “Democracy in Question: Reply to Deflem” Footnotes, July/August, 32(6):9-10. Deflem, Mathieu. 2005a. “Comment” (on public sociology). Contemporary Sociology 34(1):92-93. ____. 2005b. “Southernizing Social Forces.” The Southern Sociologist, Newsletter of the Southern Sociological Society, Winter 2005, 36(3):12-15. ____. 2004a. “The War in Iraq and the Peace of San Francisco: Breaking the Code of Public Sociology.” Peace, War & Social Conflict, ASA section newsletter, November, pp. 3-5. ____. 2004b. Letter to the Editor (“The Proper Role of Sociology in the World at Large”). The Chronicle Review, October 1, p. B17. ____. 2004c. “Large Mug, Mousepad, Infant Creeper, Bib, Dog T-Shirt: The Professional Group Revisited.” Perspectives, ASA Theory section newsletter, 27(4 ):15. ____. 2004d. “There’s the ASA, But Where’s the Sociology?.” Public Forum letter. Footnotes, July/August, 32(6):9. Goodwin, Jeff. 2004. “From the Chair.” Comparative & Historical Sociology 16(1):1-2. See related writings on public sociology.